I think I’m done testing air purifiers. Yes, I’ve said this before, and I admit I often enjoy crunching the numbers, but I think I mean it now. The only possible way I could be persuaded to test another model would be an amazing breakthrough in technology. But it would still have to be reasonably affordable, even under 1,000 RMB per machine. Crazy, no? Actually, it’s not, because I sold all my IQAirs and my Blueair and switched to six air purifiers which cost me a total of 5,200 RMB. That’s right; a total of 5,200 RMB, for six new machines. I hardly doubt I need to remind most of you that’s half the price of only one of the many popular machines on the market now. And as this article will show, I’ve proven that these new machines are keeping my family’s indoor PM2.5 under 10 ug/m3, which is the goal of the World Health Organization and thus should be everyone’s goal (read more about that here). So why would I even want to test anything else? As to which machine, many readers probably already know my answer because I started to test them last year: the Xiaomi 小米空气净化器 at 899 RMB, covering 48 square meters (apparently there’s a newer, smaller model as well for only 699). I initially blogged about Xiaomi last year discussing my test results of indoor air purifiers under 1,000 RMB. 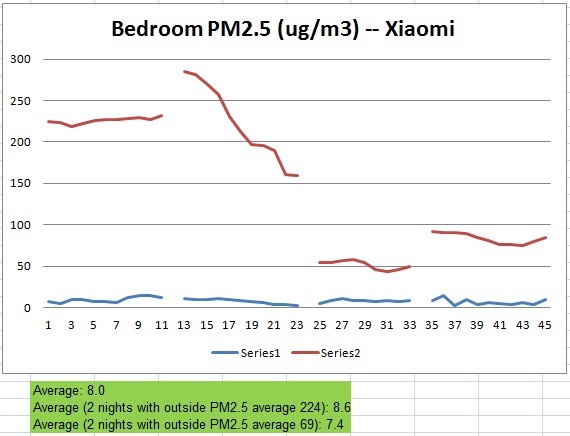 After last year’s testing, I had replaced two imported models in bedrooms with the Xiaomi purifier, and my bedroom air has been just fine since the switch. Just a few weeks ago I made the really big leap, returning two large air purifiers in my front rooms with three Xiaomi purifiers (I needed one extra as the coverage was comparatively less). And for the record, I am getting no promotional money or free anything from Xiaomi. In our nine years in China we’ve always used well known imported air purifiers to cover our front rooms, which are essentially one large open space covering 83 square meters. But the price gouging in China always galled me. So after last year’s testing of purifiers under 1,000 RMB, I was always thinking, why can’t I see if I can also replace these big machines in the front rooms with something of more value yet equally effective? The timing was perfect as we’ve had multiple December days way over 200, 300 — and the worst two days of pollution I’ve ever seen in Beijing in my nine years here, our 2015 Airpocalypse with readings over 600 and an eerily dark, yellow sky in the afternoon of December 1st. Even a quick glance at the graph above tells me everything I need to know: my living room air (the blue line) is generally exactly around 10, and always under 20 even as the outdoor air climbs up. And as Beijing’s annual average is 70-90 ug/m3, my three Xiaomi machines easily get me to my goal of 10 during those typical days — and at a nice auto setting with very comfortable sound level. For calculated averages over this week using the Excel spreadsheet data from the Laser Egg, my front room average was 6.1 ug/m3 when outdoor air was a relatively clean 61; 9.8 during heavier days averaging 136 outside; and a still respectful 14.4 when outdoor air tanked for a couple days at 220 (that’s an impressive 93% reduction). You notice there are a few spikes on the blue line, but all of those are easily explainable as with any other air purifier I’ve had: either the windows were open while we were using our laundry dryer, or we were cooking, or the machines were accidentally off for a while and no one had noticed. So let me be perfectly blunt to those in China who say that an indoor PM2.5 of 10 ug/m3 is impossible and too expensive: I say that’s nonsense, especially now, certainly on the money side. A goal of 35 ug/m3 still gives everyone a 15% increased mortality risk, as the WHO specifically mentions in their Air Quality Guidelines. I do realize this is a sensitive concept for some readers, as many people have spent a lot of money on air purifiers, or even work for those companies. And it’s fair to point out that these Xiaomi replacement filters don’t last as long as others (three months, although they’re only 179 RMB), and their HEPA filter at 99.3% (rated H11) is not as efficient as most other higher-end machines’ filters, and maybe the machine’s solidity isn’t so great, and perhaps they may break down sooner than other machines. We simply don’t know yet, as these are new machines only a year on the market — which in itself should give people some pause. Also, the built-in sensor is quite inaccurate and pretty much useless to follow — but I’ve never found sensors ever reliable on any air purifier, and I always control all of them manually anyway (and none of the major brand machines ever had a sensor anyway). The sensor’s more concerning issue is that it thinks that a PM2.5 concentration of 75 ug/m3 and under is safe. That’s simply too high, and even the Chinese government rating of 35 would be more proper. I of course think 10 is best, but for a machine made in China I would think 35 is reasonable. So if people are using a Xiaomi and relying only on the sensor on auto speed, then indeed they still may be inhaling not great air. This again is why everyone, using any type of air purifier, should not be relying only on any machine’s auto setting ever (my personal opinion). You need to get a separate monitor and use that to test your air.) And yes, Xiaomi is mostly a cell phone company first. But let’s be very clear here: I’ve mentioned many, many times that anyone living anywhere in polluted areas, whether China or India or Los Angeles, has an ultimate goal to get your indoor air pollution under the World Health Organization’s goal of PM2.5 under 10 ug/m3. The scientific data is very clear; any PM2.5 over 10 starts to have health effects. So people in polluted areas absolutely must have air purifiers indoors, where you spend 90% of your lives. At the very least, put one in your bedroom. And for heaven’s sake, make sure your children’s rooms are all protected. So you’re more than welcome to get any air purifier machine you want, as long as you’re reaching your goal of PM2.5 under 10 ug/m3, and routinely monitoring your air afterwards (perhaps with the new Laser Egg, only 499 RMB) to make sure all is working fine. In terms of which air purifier is best, again I’ve mentioned often that all that anyone needs for indoor protection is a good filter attached to a good fan. I’ve tested many models over many years, in real world circumstances in my homes, and no particular model at any price point ever was so obviously better than the rest. This is why I am perfectly comfortable with my current setup. Previous Post我在北京的行医之旅Next PostSafe Salmon in China? Yes! Hi Richard, thanks a lot for the test. I have read lot of your tests on air purifiers. I live in Germany and want to get a good air purifier for my mom who lives in Ningxia, China. Have been struggling in searching for a long time but couldn’t decide which one to get since, you know, there are so many products and so many advertisements in China are fake. Even more, some of the nice review/test results can simply be bought. But I trust you as a doctor and as a father who cares much about your family. Just one more question: you said maybe the Xiaomis are not so durable as those big brands. How long have you been using them? Since you have 6 at home, did any of them break? Sorry to bother you again but my situation is that I am not living in China so I have to remotely do everything via internet. Once they break, that will be too much effort to get it repaired or replaced, if possible at all remotely. Many thanks for your reply in advance. They’ve only been around for a year so who knows how long they’ll last. But I’ve had a few since February and so far have zero problems with all of them. Hi – great article and overall you offer a wealth of relevant infomation on your site. Quick follow up question – how would you rate or recommend use of the Xiaomi’s if primary concern is the management related to Mould concern. Are these HEPA rated units? Thank you for the informative post. I am an avid Chinese reader of your blog and book. I finally persuaded my parents in China to buy two Xiaomi air purifiers in their apartment as you recommended. However, I noticed that, like many old people in China, they open their windows a lot to “circulate the fresh air”, which was long believed as a good habit. I don’t think this “good habit” is applicable to the poor air quality now. So my question is how you usually operate all of your purifiers. For example, let’s assume if the outdoor air quality is bad for the whole week. Do you keep all of your purifiers running 24×7? At what level? Do you keep the purifiers running even if you are not at home? Or do you open the windows to let the fresh air come in when you are away? Do you turn to the maximum level for a while before you enter any room? I think the usage information will be very helpful for your readers or patients to replicate your excellent results. Thank you again for your constant effort to teach us the importance of air quality. As an average reader of your blog, I learned a lot. In general, air purifiers should be on all the time, 24×7 in places like Beijing. Unless the AQI is under 50, which is extremely rare in beijing, maybe 1 day in 30? So it’s not a good idea at all to have windows open, probably in most cities in China. 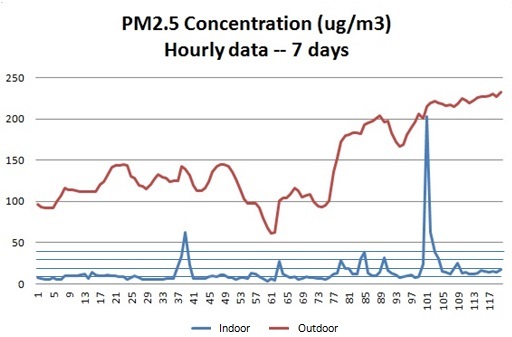 If people want to seriously decrease their long term exposure to PM2.5, they need to have a purified indoor space. Thanks a lot for your quick reply. So 24×7 in medium level should be a good rule of thumb. 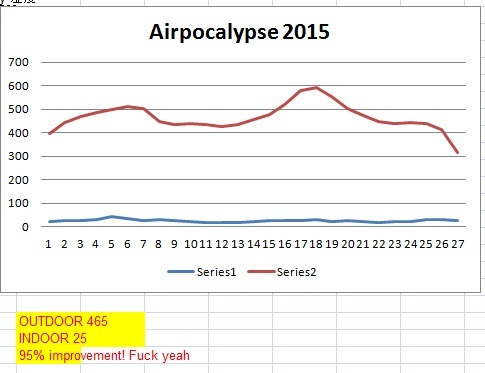 Then it can be adjusted based on the ourdoor air quality level. Thank you for always posting great and informative content. I moved to Shanghai due to a work transfer about a month ago, and even before moving I started reading through many of your posts to get a feel for the best N95 mask and purifier options. I am quite sensitive to the pollution, and want to ensure I avoid as much exposure as possible. If I go outside for even a few hours, I already feel tired and sluggish from the air here. After being in a hotel for a month, I am about to move into an old style 2-bed apartment. The unit is roughly 100 sqm with vaulted ceilings and a loft in the main living area. I could use your advice on the various purifier options. The landlord is providing one BlueAir 403, but I would like to have at least 3 more purifiers in the apartment to ensure the 5 changes per hour you specify. Based on your reco, I bought a Xiaomi to use in my hotel, and plan to bring this with me to the apartment. I now plan to either buy either 2-3 more Xiaomi units, 2 Blue Air 503s (import from US), or 2 of the Alen BreatheSmart purifiers (import from US). Any thoughts? My concern with the Xiaomi units is that they basically stay on auto all day, and I cannot vary the fan speed for more than 12-minutes unless I keep putting it back in high speed mode. Your data suggests auto mode is totally fine if the unit is used in a properly sized space, but do you have concerns about this? Auto-mode relies on an internal monitor, but as you say, the accuracy of these is dubious. Do you have any Xiaomi readings to compare with your Laser Egg? Regarding the Alen BreatheSmart purifiers, on the web site they seem to waver between calling their filter element HEPA-Pure, HEPA, and HEPA-style material. Is Is this an actual hepa filter or just some proprietary filter they are trying to market as hepa? Also, the last Alen you reviewed was the A375 in 2011. How come? Alen and Xiaomi claim 99% removal of .3 micron or greater… is this enough? Blue Air has an actual HEPA and claims 99% of .1, but is this meaningful? I am a bit confused about the various options. I do plan to buy a Laser Egg (sold out at the moment) or Blue Air monitor to keep an eye on things. Thank you for any help. I am coming from the Western US, and am having some difficulty adjusting to being concerned about my air, food, water, etc. on a daily basis. I recently moved to Shanghai due to a work transfer, and have been lurking on your page reading through as much content as possible on air purification options, masks, etc. Oh wow! I downloaded the app, but given I am on hotel WiFi still I was unable to connect the purifier to the network. Once I move into the apartment I will definitely finalize the set-up and check out the additional speed settings. Xiaomi sounds like the winner! Given the price and effectiveness, it is hard to justify anything else. Yes the wifi sync can be very tricky, I usually need a couple attempts before it works. But once it does, it’s perfect. I have a question about filter lifetime and cost? For how long that we should change the filter. Is there any reason to follow their 3 month rule (it says 3 to 6 months on the filter itself by the way), and not just monitor the air quality until you notice that your purifiers aren’t performing as well? I don’t see any reason not to just keep checking with a sensor. I’d recommend the same with all air purifiers. Many times they need replacing in Beijing far earlier than stated. Hi Richard, thank you for the great post. It should be noted that Xiaomi copped the idea from Balmuda (pretty blatant copy), a Japanese firm that designs some cool products – and I would imagine quality is a non-issue for their respective Air Engine, which is more expensive of course. But good of Xiaomi to be a disruptor with their affordable offering. Now that it’s settled as to a suitable home air filter, could you provide any further information on the Free Air? I’d like to buy one ASAP and ditch the plethora of masks I’m currently wearing (Totobobo, Vogmask, 3M, local ones, I’ve got ’em all…), or if you can provide a possible ETA on availability? Yes I saw how Xiaomi’s machine looks almost exactly like a cool Japanese machine (6 times more expensive) so it certainly is a bit unseemly and very “Xiaomi” to rip off other designs for much cheaper prices. I’ll let the legal guys handle that but it still doesn’t change the fact that it’s a good value, efficient machine. The air purifier industry in China has for too long profited from people’s fears, and Xiaomi is just the most classic example — along with Smartair — of how indoor air purifiers can be really, really simple and inexpensive. The Freeair is available right now, finally, although a bit difficult for expats who don’t speak Chinese. There will be a website soon but for now in China it costs 7,999 RMB and you need to call 400-706-8211. Maybe easier for many Americans expecially right now is via Amazon USA website, for $699 USD: http://www.amazon.com/gp/product/B010MPIEMI And their original website is here http://freeair.com/ I’d like to remind my readers that I am one of the many medical advisors for Freeair ( http://freeair.com/doctors/ ) so it could be seen as a conflict of interest for me to be talking about Freeair. But as usual I am giving my readers full disclosure here, and everyone’s welcome to make their own decisions. I personally am quite proud to be part of such a revolutionary product. -you can not manually turn them on medium , this only happens trough the app. – their inside sensor does not give an accurate reading…But ,usually , sensors integrated to a purifier are always off. All that being said. it is still my first choice, and the reason why I picked it for our office. Can we clarify Xiaomi readings once and for all? From my understanding what you see in the app as your indoor reading is pm2.5 in mg/m3 and basically same goes for outdoor reading using Chinese standard which by my experience is equal to mg/m3 and not actual AQI calculated by US standards which is higher. As for safe values from what I read maximum recommended by US standards is 12mg/m3 while WHO recommendation is less strict with 25mg/m3 being considered safe maximum. Please totally forgot about AQI, it’s not part of Xiaomi at all. The numbers are concentration, ug/m3. Safest value of PM2.5 long term is 10 ug/m3 by WHO and same in USA (10-12). That’s the basics. Yes the Chinese average of 35 is the official WHO recommendation for Interim 1 Target, for developing countries. But WHO clearly states that 35 still allows 15% more deaths compared to 10. One could easily argue the exact opposite, that even the US and the EU are too lax and flying in the face of the official WHO 2005 report recommending 10 as the annual goal: http://www.myhealthbeijing.com/china-public-health/indoor-pm2-5-under-10-a-noble-goal/ All these countries could be argued to be making politically expedient choices but still leaving some very well documented health risk to their citizens. I bought the Xiaomi last year after reading your post. I was quite happy with it but during this terrible polluted month I’m getting levels between 60-80 inside home with the Xiaomi App. Which levels do you usually get with the Xiaomi App? Do you find big diference with the Laser Egg numbers? I may have missed this in this thread, but can the Xiaomi be used at all without the wifi app? I am considering purchasing one for my office at my school in Haidian, but I am a tech troglodyte, which is why I love my Smart Air Cannon. My school has its own wifi system with its own firewalls, etc. I think I read that the medium level is available only with the app and that the wifi works only on home wifi systems. Are there other such limitations? Yes the main button does auto, sleep and max speed for 15 minutes then back to auto. So on most days the auto and sleep are fine but right now that middle speed is very useful, which is a shame if you can’t use the app at work. I’m living in Guangzhou on the 11th floor of a building near a road with many cars that pass through every day. Recently i’m experiencing same pain in my neck and am worried about the air pollution in my home. I recently saw that they came out with a new xiaomi air purifier 2 that is slightly smaller then the original. Have you tested it at all? Would you recommend buying the newer one or sticking with the older one? Its my first time buying an air purifier and don’t want to waste money on something that doesn’t work very well. P.S. also would prefer not to spend too much money on a several thousand rmb air purifier so thought this would be perfect for me. I was wondering if you had a chance to check out the xiaomi air purifier 2? I know your busy but any insights would be great as i’ll soon purchase one. I have two Xiaomi air purifiers and use them mainly in manual mode. Do you know whether the ambient light sensor on top of the machines is of any use? Even in auto mode it does not switch to night mode if it is getting dark. Another question regarding changing the filter. If I change the filter before the app tells me to, can I reset the timer or do I just ignore it and confirm the filter performance with the laser egg? The sensor is on the side of the machine; the light on top is only to show power. You can shut off those lights if you want, it’s in the app under settings. And regarding filter changing, it could get clogged more quickly than 3 months especially now in this horrible winter, so using a PM2.5 monitor may be more helpful. The ambient light sensor (or photo sensor) is on top of the machine. To my understanding this should trigger night mode automatically. At least this is how the light sensor is used at the Phillips purifier. The green light shows the machine is on or off and has wifi connection. This I can switch on and off in the app. Yes I saw that report, very interesting — but I’ve always said not to use auto setting for any machine, including Xiaomi. Plus that’s the Xiaomi 2, not the first generation that I had tested so it’s hard to compare. I am a new arrival in Hong Kong and going to buy a few air purifiers. Goes without saying, your articles have been of great help for someone with 0 understanding of the issues at stake previously. I am thinking of going with either Philips/Xiaomi/Blueair. A couple of questions – your help would be much appreciated. 1. Some new philips models have formaldehyde filters. (e.g. AC4026 with filter AC4127). The layman in me can’t figure out if these are improved HEPA filters with some additional formaldehyde filtering capabilities or just formaldehyde filters with no HEPA filter. I would presume HEPA filter to be a more important concern. 2. I was almost decided on Xiaomi when I saw the particlecounting post. Is it fair to say that this automatic reversion to auto setting is a serious enough disqualifier for day to day usage? Or is there a work around? Wait a minute, isn’t it so that filter rating of E11 means that it will be 95% effective, and that actually implies that 5% of smallest, most harmful particles below 0.3 µm will be left over? That’s why to get a higher rating it’s all about fighting for “nines” H13 99.95% – H14 is 99.995%, U15 is 99,9995% and so on… So Xiaomi advertising high CADR (air flow) with E11 while Philips or other brands have H13 sounds like a joke. Sure you have better airflow if you use less restrictive filter. And correct me if I’m wrong – it will not filter out the smallest particles by running the same air again and again, they will simply pass through every time? So you are happy with your “clean air”, your PM2.5 sensor says “all green” while you are actually being killed by PM0.3 at the same time? pollution is destroying our lives. and all we are doing is more and more pollution. we must keep in mind about what legacy our ancestors transferred us, and what we are giving to our children. Hi Richard, thanks for your work on this. I’m wondering if you know anything about recycling the used filters? Can one send the filters back to the company? Thanks again!